"It doesn't do to be too starry-eyed about the Virgin Queen. Elizabeth the First was only too obviously made of flesh and blood. She was vain, spiteful, arrogant - she was frequently unjust and she was often maddenly indecisive. But she was also brave, shockingly clever, an eyeful to look at - and on occasions she was genuinely wise." As far as epitaphs go, that's a belter. I think I would be well-pleased to be described as vain, spiteful and indecisive (qualities I have oft-encountered in myself), if I might also be considered brave and clever. Most of all I'd love to achieve that genuine wisdom - or as Elizabeth herself might say: the heart and stomach of a king. You see, I have lived almost three decades on this planet, and sometimes I like to think that I am reasonably worldly and more enlightened about my own nature and the greater human condition. But then I have moments - too many moments - when a childish selfishness overruns all other thoughts in my brain, and influences my moods and words. 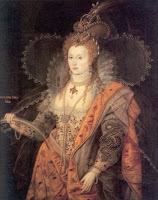 It's then I realise my three decades don't mean much - certainly not by Elizabeth I's lofty standards. So how does one go about gaining wisdom? Can an over-emotional, over-sentimental fool like ever me hope to achieve a Zen-like state of calm all-knowingness? And what are your favourite words of wisdom? I'd settle for the liver or kidneys of a king. Who's Queen? 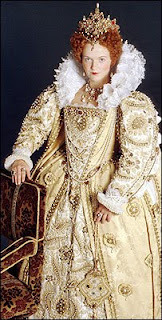 I know a lot of costuming people, and I like the joke "What I'm wearing is late Elizabethan" Confused look. "Elizabeth 2, I can't see our monarch lasting another two decades..."
'Better dead than zed' or by the team at zombie tools - 'Can't save the world, then prepare for it end'. Though why prepare in the face of such overwhelming devastation, why prepare to go on after the unthinkable? I want to be there tosatnd against the ruthless, the unencumbered by conscience. "Anything you can throw away you didn't need in the first place." Doc - mmm, liver. I'd settle for the pancreas or appendix at this stage. Barnes - You made an interesting point. What's the point of achieving any wisdom if I'm not prepared to guard my brains against impending zombie attack?